Print your logo onto these custom printed standard mouse mats - 3mm rubber or one of our other innovative mouse mats and use them in your next marketing campaign as a unique giveaway item. Our custom branded textured mouse pads have been our number one selling mouse mat of all time! These economically priced high standard mouse mats which are great to work on will come with your logo printed in bright full colour. These computer accessories are great for office or for corporate business to business promotions. We can print these with Variable Data Print where they can be personalized by name or number etc. at extra cost. Other innovative corporate gift ideas that could be suitable to create brand awareness include these cheap promotional 3in1 Mouse Mats - Screen Protectors & Cleaners, quirky advertising gifts such as these Business Card Mouse Pads or how about using one of our more bespoke custom made products such as these great quality Gripz Mouse Mats & Coaster sets? Custom brand these rectangular mouse pads or one of our best-selling promotional computer gear»mouse mats with your company logo! Personalize your standard mouse mats - 3mm rubber or custom design mouse mats for your marketing campaign. 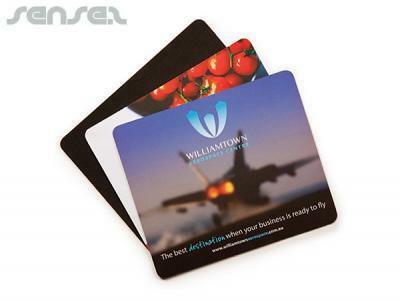 How can these unique promotional standard mouse mats - 3mm rubber or our personalized mouse mats fit in with your marketing strategy and help you maximize your brand exposure? Our custom made Standard Mouse Mats - 3mm Rubber can be produced from a minimum quantity of 100 pieces. We can have your logo branded on these corporate Standard Mouse Mats - 3mm Rubber in Full Colour Digital Print. A setup fee of US$84.00 will apply to make the film.